Do you work for VirtualBox? VirtualBox is an open source x86 and AMD64/Intel64 VDI solution for enterprises. Learning about VirtualBox? We can help. "Virtual machines easy to create and configure with VirtualBox with a wide range of functions and fre"
virtualbox is one of the most useful tools for any IT professional, this tool has helped me many times to virtualize operating systems, virtualbox is my favorite tool to make virtualizations because it is quite easy to use, features great features and functions, is totally free developed by Oracle offering this great service, I like it for the ease it offers to perform the configurations and installation of any system that wants to virtualize under this platform, offering as real as possible of an operating system without any type of failure, I like because among all the software of this type, it is really the one that is adapted to my daily needs, configuring the virtual machines are quite simple and the performance is quite pleasant. VirtualBox since the time I have been using it has not presented any kind of problem, really the tool has always been for me when I need it covering my needs in the workplace and student, as every time I learn new things and use the tool to perform different types of laboratories that must carry virtual machines or in which I do not have physical equipment to use and I have no choice but to virtualize and I have always done it with virtualbox since it offers me the necessary functions to perform this type of Actions. I personally recommend VirtualBox because this tool is quite complete, it has functions that are quite easy to use, the configuration of the virtual machines are really simple, you do not need great knowledge on how to do it, the information necessary to use it can be found on the internet and even in tutorial videos that help to understand the tool, it has a simple and intuitive graphical interface that will be of much more help for the configurations and creations of the virtual machines, it is totally free and will fulfill all the needs that are presented, It is quite fluid and is always up to date. and thus between other types of operating systems with the need to put it to tests in laboratories and even put it in a productive environment, most of all operating systems that would work as basic servers such as FTP or TFTP. Lo que mas me gusta de Virtual Box es poder crear varias máquinas virtuales con diferentes sistemas operativos dentro de mi computadora host. Es muy fácil de usar y además es gratuita. No tiene nada que envidiar a otras soluciones como Vm Ware. Además, es posible crear varias máquinas virtuales con diferentes sistemas operativos, ya sea para realizar prácticas o pruebas, o bien para tenerlas en producción funcionando de forma real. La gran ventajas de hacerlo así es que al tener entornos virtuales permite ahorrar energía y costes de hardware, ya que al estar funcionando sobre una única máquina real el consumo será mucho más pequeño. Lo peor de Virtual Box es que tener varias máquinas virtuales corriendo a la vez consume muchos recursos de la máquina real o host. Necesitarás mucha memoria ram y un buen procesador para poder realizar simulaciones correctas. Para poder utilizar el copiar pegar tanto texto como archivos de la máquina host a la virtual requieren de un proceso algo tedioso de instalar en las máquinas virtuales las Virtual Tools para poderlo habilitar. Muy recomendable, es gratis, es sencillo de manejar y es muy útil para tener corriendo varios sistemas operativos en una misma máquina. En nuestro centro de trabajo Virtual Box se ha convertido en un programa muy importante, ya que lo utilizamos para poder practicar la creación de dominios con windows server y varios clientes conectados, todos simulados desde Virtual Box sin tener que recurrir a entornos reales, lo que sería mas costoso y laborioso. VirtualBox is a program that allows you to create virtual containers on which you can run your chosen operating system. The main advantage is the fact that VirtualBox allows us to virtualize cross-platform virtualization so that on the selected system we can run the selected system (for example, on Windows we can run Linux). Another advantage is the fact that VirtualBox enables us to fully support the virtual system, including support for USB and iSCSI devices. It is worth mentioning that VirtualBox is isolated from the kernel of the main system so that editing the virtual system does not affect the main system, so we can investigate what impact the program has on the operating system. One of the drawbacks that I noticed is that some Linux systems running on VirtualBox have a problem with drivers for AMD graphics cards. If you are looking for a solution that will enable you to run a virtual system, you should consider trying out VirtualBox now, especially since this program is available completely free of charge. By using VirtualBox on my computer I can run the chosen operating system to test the product, so I save on the purchase of VPS. "Diferentes ambientes de sistemas operativos en un equipos ÚNICO." Una de las cosas que mas me gusta de VirtualBox es lo fácil que es utilizar este software, su instalación no es para nada complicada, sencilla y rápida al igual que la descarga. Crear maquinas virtuales con los diferentes sistemas operativos es sumamente sencillo. No me agrada que si muy bien puedes asignar memoria y espacio en disco, es que dichos recursos son tomados desde los físicos de tu PC y cada vez que inicies una maquina virtual los recursos que asignaste serán tomamos por el ambiente virtual, lo que significa que debes de contar con un equipo con las suficientes características para tener una experiencia fluida con el software. VirtualBox es una herramienta ideal para aquellas personas que desean o tienen la necesidad de aprender y utilizar un sistema operativo que no es habitual. No solo para esto, virtualbox se utiliza en muchas empresas para virtualizar ambientes de sistemas operativos de servidores, realizar pruebas y mostrarlos en el cliente final, o simplemente para virtualizar la última actualización de un sistema operativo y comprobar si la misma es estable para comenzar a utilizarla de manera definitiva. Lo e utilizado mayormente para documentarme con distintos sistemas operativos que no son de mi uso diario, por ejemplo windows server. E realizado numerosas pruebas con este sistema operativo virtualizado en un mismo equipo sin la necesidad de contar con otro o eliminar el sistema operativo que utilizo por defecto. "VirtualBox, the portal of my equipment farm"
I recommend, as I said, the tool is demand in this regard to create new configurations of virtual machines to perform in the environment where you are. VirtualBox is my favourite tool I use to virtualise operating systems, and it allows me to test applications on different operating systems before implementing them. It is worth mentioning the fact that VirtualBox can work well between the host system and the virtual gives us the ability to copy files which is very useful and the ability to move the virtual machine to the memory so that we can move our virtual system to the workplace without losing the configuration. - A problem during installation of some operating systems. - We need to enable virtualisation in BIOS. - It can put a significant burden on weaker equipment. If you want to test another operating system or check the application before deploying it, you should consider choosing a VirtualBox, because it will allow you to test the chosen system without interfering with the files. Thanks to using VirtualBox I save a lot on purchasing VPS, and I can test applications on many available systems, which do not always support hosting. "Create Virtual machines of every OS"
The possibility of configuring virtual machines as if they were physical equipment so that a USB memory connected in the Host OS can be redirected to the virtual machine and make it function as a USB in a native way, this applies to any type of device that uses a USB connection. Also the possibility of installing the application in any operating system as it supports Windows, Linux or MacOS and in terms of virtualized systems it is possible to emulate even Android and iOS mobile devices. It is also possible to import or export the HDDs of each virtual machine of other people and use them as their own, thus facilitating the need to install from the beginning. The application technically is not very attractive but works as expected without any type of bug or serious failure that prevents the installation or reproduction of the virtual machine even when using little known systems or recent implementation such as mobile devices. - The interface as well as the organization of the options could be improved, sometimes one must search long before finding what you are looking for. - Many options that are not well understood what is their function so one should waste time trying one by one that makes each of these options. - It would be very useful to be able to do without the VirtualBoxGuestAdditions and that these were installed by default in the virtualbox kernel. There is only one alternative to VirtualBox and as far as I know, it is necessary to pay for the application, I think this is enough reason for you to end up using VirtualBox but if it is not enough, you should know that this application is a pioneer in the world of Virtualization and manages each OS as if they were a real and physical equipment so the emulation is 100% accurate with what you find on any desktop or mobile. As a graphic designer of interfaces I sometimes work designing UI for Android and iOS and I need to test how they are in the device, so I turn to VirtualBox to virtualize these mobile operating systems and check how my UI works. "Best application to virtualize OS"
- The ability to share direct and clipboard between the main machine and the virtual machine is very useful when you need to transfer files from one side to another. - The implementation of OS is totally transparent to the user so that you can use any OS features without any problem, even USB devices. Although virtualizando operative system has always given me good results there is a negative aspect that I did not like VirtualBox and is that in the field gaming is very behind other alternatives in which if you can create VFIO machines to be able to make use of 100% of the graph and play from Linux as if you were in Windows. I recommend using VirtualBox because it is the application to virtualize more complete operating systems by not including license costs and being open source. It even serves to virtualize Android devices. I share the same computer for my work and for my personal leisure so I was looking for a way to keep both environments separate and not fill programs that I do not need in my personal life the host machine and with this application I have simply created a virtual machine in the what works and installed everything necessary to develop this activity. VirtualBox is the perfect tool to virtualize machines and run various operating systems such as: Linux distributions, Windows in different versions, Mac, among others. The management system is easy and the installation of the images is very fast. USB 3.0 support is great and allows for adequate flexibility. With VirtualBox I can have multiple systems in the same computer, thanks to this I can plan performance tests and evaluate features in programs that work better in one system or another. VirtualBox has an extensive community of users that help you solve any problem and since OpenSource is free you can make modifications according to your taste. The consumption of VirtualBox resources is exaggerated, a lot of RAM is needed for each machine and this is not efficient for use on the server. Many cores must be assigned for machines that need to run heavy programs and this does not facilitate the virtualization of services. The interface of VirtualBox is already old and outdated, it urgently needs a new appearance. If you need to virtualize many machines and have the necessary hardware resources, install VirtualBox and you will not be disappointed. The developer community keeps the software on the line. With VirtualBox we can virtualize simulations, test environments, virtual scenarios and anything we want to achieve the validation of the proposed solution. With VirtualBox we can also run specific programs that work better on other operating systems than Windows. "Excellent software for operating system virtualization"
I help in the company to be able to install virtual test units, this favored splitting the main server and its resources in different parts, and being able to use each virtualization for a different purpose. "Virtualize every OS with VirtualBox"
I work from home as a freelancer and VirtualBox allows me to separate my work system with the OS that I have for personal use. In my work environment, that is, my virtual machines (I use more than one), I can test all the applications that I program by submitting them to different environments (Windows and Linux mainly). What I do not like is that Virtualbox does not limit your RAM consumption so that many times if you are not careful you will find that your computer and virtual machines are blocked and you must restart your computer. I recommend VirtualBox if you want to run different operating systems without having to leave your host system. If you have doubts you should know that VirtualBox is totally free. I needed to keep my personal and work environment separate since I need to install many applications to work that are useless to me in the personal environment and with VirtualBox solve this. In addition VirtualBox is a free program. "Potente herramienta de virtualización gratis "
VirtualBox es una excelente herramienta gratis y de código abierto que me permite crear maquinas virtuales donde tener distintos escenarios de simulación o pruebas. Es una ventaja que soporte casi todos los sistemas operativos existentes, ademas de poder montarlas usando RDP para el acceso remoto. El soporte a complementos externos es perfecto y como se tiene detrás una gran empresa como Oracle se garantiza el funcionamiento perfecto de la plataforma. La interfaz y la experiencia de uso son geniales, es muy fácil asignar los recursos a cada sistema y correrlos inmediatamente. La optimización de recursos en VirtualBox no es la mejor, hay que aceptarlo. Se requiere un buen hardware para poder correr las maquinas virtuales bien y sin latencia. De modo que se necesita hacer la inversión para este fin. De resto no tengo mas comentarios negativos sobre VirtualBox, realmente disfruto usarla y me da los resultados que quiero. Existen muchas opciones para virtualizar maquinas actualmente, pero VirtualBox sigue siendo uno de los lideres del mercado. Recomiendo esta plataforma si necesita estabilidad y buena integración con todos sus sistemas operativos. No lo defraudara. Con VirtualBox puedo tener varios entornos de desarrollo de soluciones, ejecutar varios proyectos al mismo tiempo y hacer pruebas en una sola computadora. Como se pueden montar versiones de Linux, Unix, FreeBSD puedo hacer simulaciones con cortafuegos libres como pfSense. Otro beneficio que obtengo con VirtualBox es correr varios sistemas operativos en mi maquina. excellent tool to create virtual laboratories, is very easy to use very light and has excellent graphical interface that helps even more intuitively to generate our virtual machines as we want. I really like the diverse devices and systems that can be virtualized with this program without any kind of problem. So far I do not have any kind of disgust with this tool, it adapts to all my expectations and I have great experiences with it, I can virtualize anything with it and put it first in virtualization. an easy and free solution to virtualize in the simplest way is virtualbox, I recommend it totally for any environment, work or student, they make very good testing laboratories and help to make classes and / or workshops where we have to use several systems As long as good recuers are available in the host machine, there will be no problem. "Incredible tool to test operating systems"
I like that virtualbox is a free and open source platform, which anyone can use to upload and create virtual machines, this allows testing operating systems within another, and make both work at the same time. In addition to having support for USB 2.0 and 3.0 connectors, but using an extension. It also allows you to create snapshots to restore the virtual machines where they were left. "VirtualBox, test your software in different environments." What we like most about virtualbox is that we can test the software we develop in our business for our clients in different operating systems quickly and safely because VirtualBox perfectly emulates all operating systems (and it supports all of them). In addition VirtualBox is a free and open source solution backed by Oracle, also offers additional plugins that add extra functionality. We need USB 3.0 devices support in one of the virtual machines and it worked perfectly. 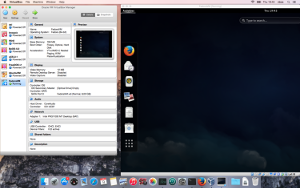 VirtualBox also offers a multi-platform environment with support for Windows, Linux and MAC. It is also updated constantly. - You can share the installation with other people as it allows you to import and export the virtual machines. There is a problem with the Linux version and it is that it requires an additional package called "Virtual Box Guest Additions" that adds features such as improved screen resolution and full screen but as I say, in linux sometimes it does not work properly and you have to Do some extra configuration. Because it is a known problem one can find help on the internet. If you need to virtualize operating systems VirtualBox does it perfectly and also does it for free unlike its competition. We needed a quick way to test in the software that our company develops for different operating systems and VirtualBox gives us a convenient, fast and free solution. Thanks to VirtualBox we no longer have to compile our software, copy it to USB and take it to another computer, with VB the software can be tested in the same machine in where it is developed. "Incredibly powerfull, yet free and opensource"
VirtualBox is the Go-to software, when it comes to VM creation and configuration. It's easy, lightweight, and with A TON of features. It allows you to create VMs and configure them individually or by groups, import and export VMs, take and manage snapshots, among other configurations. It also includes support for most Virtualization technology, like Intel Hyper-V, AMD-V, etc. The fact that the updates are too frequently. It would be better if they do like a rolling release for the bug fixes, and major release for the functionality updates. However, since it's a opensource application, it's understandable. Consider VirtualBox if you need a fast way to create VMs, and need to deploy them fast. Also be aware that, to get better performance, use a CPU that has proper support for virtualization, and a decent amount of RAM memory, since the guest systems are feed from the host system resources. The need of computers with mostly low level hardware (Low core count, <2GB ram). The biggest benefit is that, with one single computer of medium specs, we where able to deploy 4 VMs with more than enough capacity for the required task. "Everything you need to do software testing in a single workstation"
What I like most is that tool is free, easy to use and functional. These characteristics is what makes software distinguish from other similar ones. I also want to highlight its functions, such as: It allows installing virtually any operating system such as Linux, Android, Mac OS X, Windows, Chrome OS, etc; unlike others in the market. It is extremely easy to create an environment for testing of all kinds. In this way we will easily obtain a test environment completely isolated from the rest of the systems. Virtual machines and virtualization allow to use a single service per virtualized server easily and simply. In this way, even if one of the virtualized servers is dropped, the other will continue to work. Finally, the fact of virtualizing servers or operating systems can mean significant savings in maintenance and energy consumption. Directly on the software, I could not say that there is something that I do not like, it is quite efficient. The issue is, we must have a computer or workstation that is powerful, since, if we use 2 operating systems simultaneously we are using twice as many resources. In addition, it is also possible that sometimes operating systems and programs will run slower in virtual machines. This is because the virtual machines can not get an ideal performance of the hardware that we have in our team. The more powerful our computer is, the less you will notice the loss of performance. Nice free virtual machine tool to keep my primary workstation from getting too "cluttered"
I use VirtualBox almost daily to test the code that I develop. It is very useful to try your codes in a virtual environment before sending them to production, Specially if you are a linux user a need to test code on windows. "Virtual Box. Múltiples SSOO en tu máquina aniftrión." Virtual Box es un software que después de su instalación y la habilitación opción correspondiente en la BIOS de su computador, le permitirá disfrutar de la posibilidad de tener en una máquina real varias máquinas simuladas con cualquier sistema operativo, siempre y cuando se disponga de una imagen del mismo y se instale de forma correcta. Podríamos tener diferentes versiones de windows, linux, etc corriendo en un entrono microsoft diferente. - Crear entornos de prueba con diferentes SSOO al original. - Crear espacios independientes y seguros. Lo que ocurra en uno no afectará en otro. - Ahorro de costes y ahorro energético, puesto que si quieres tener un servidor en Linux y otro en Windows, en vez de comprar dos máquinas y mantenerlas, solo debes preocuparte de la máquina original. Además Virtual Box funciona multiplataforma y es gratuito. Lo peor de virtual box es que requiere una fuerte inversión en hardware de alta gama si se desea que las máquinas simuladas que vamos a crear funcionen de forma eficiente, y aún así, nunca van a funcionar como reales. Pero esto ya es otro tema, no es culpa de Virtual box, el programa es excelente. Virtual Box es gratuito, intuitivo y con multiples opciones que harán del arte de crear máquinas virtuales toda una experiencia positiva. Utilizamos Virtual Box como método de enseñanza y aprendizaje por ser gratuito y ser muy útil para hacer ver a los estudiantes como funciona un windows server con varios clientes, haciendo uso de dominios y active directory. Algo que sería completamente imposible de analizar en un entorno real y gracias a las máquinas virtuales es muy sencillo. VirtualBox is the perfect tool to work on multiple operating systems from your computer. It allows you to easily install different systems without format your disk. As good things, the integration of the virtual folders between the virtual machine and the real machine is excellent. Also the integration of the mouse between both systems is perfect. On the other hand, the integration of USB ports don't work enough well, either the audio that normally don't works. VirtualBox is perfect for developers who want to test their code. But also for everyone who needs an operating system different from theirs and does not want to waste time. It's really very quick to do, create the machine, load the image of the system and install the operative system normally. Basically I use VirtualBox almost daily to test the code that I develop. It is very useful to try your codes in a virtual environment before sending them to production. Also I use VirtualBox when I want to try a new operative system or just a new version. This VM is very easy to use, and it is very clear on how to add machines, how to do the initial setup, and you can add as many VMs as you need for what you are doing. This is very stable, as I have not had it freeze, shut down on me or have to restart the whole thing. I love how you can either save the state of the machine that it left off in, so you can continue whatever you are working on later, or you can completely shut it down as if you were shutting down the physical computer. Sometimes the sizing of the terminal can be either super large or super small. I have a 4k high definition laptop screen so I have to change my resolution or it opens VERY small and you cant read it. Utilize absolutely everything that this product has to offer! This is a great product with a lot of features that will save you a lot of money because of the lack of physical equipment. Not having to have actual physical machines helps cut down on cost of equipment needed and is also a big security feature for us. When all you need is the portal on your laptop, it reduces the amount of physical information you have to keep on your laptop. Especially if its a personal laptop because my company does not issue individual laptops. "Excellent tool to take the first steps in Virtualization, perform tests and simulate use cases. " It is very easy to install and configure. It is very easy to use and is compatible with a variety of systems. It is very intuitive, ideal to start in the world of virtual machines, an excellent tool for laboratories and small-scale practices. Ideal to test new operating systems, specialized software, emulate possible scenarios that can occur within a controlled environment. When creating virtual teams, it helps to reduce costs, be it in hardware acquisition, space of location (Rack or Data Center), human resources, time of implementation and adaptation. When a VM or a project that requires superior processing is performed, the application may collapse, since the same in itself consumes many resources of the physical equipment. Ideal to take the first steps in virtualization, compatible with a large number of operating systems. Excellent tool from the educational point of view. Perfect for testing of operating system updates, beta versions, etc. Ideal para iniciarse acerca de las máquinas virtuales, esta herramienta permite obtener los beneficios de la virtualización. Cuando me inicie aprendí los conceptos de nube trabajando en Virtual Box y eso me ayudó a despertar mi interés en este campo. Además, es muy fácil de instalar y conservar. Una vez instalado se pueden configurar distintas máquinas virtuales cada una con sus propios recursos virtuales, partiendo como base de los recursos físicos de la máquina anfitriona. Hay que tener en cuenta que se pueden ejecutar varías máquinas a la vez e incluso trabajar conjuntamente, pero estan limitadas a la cantidad de recursos de la maquina anfitriona. La función de compartir archivos remotos es increíble. por el momento y en el tiempo que lelvo utilizando esta herramienta, no he detectado fallos ni puntos negativos. Quizas la configuración para poder trabajar con varias máquinas virtuales conectadas es un poco compleja y lleva tiempo conseguirlo. Es algo en loque podían incorporar mejoras. ideal para iniciarse en el mundo de la virtualización y empezar con algo pequeño. Recomendado para cualquiera con curiosidad en este mundillo . En la organización nos ha permitido poder tener en una mis máquina física varias máquinas virtuales trabajando conjuntamente y cada una realizando una función y atentiendo distintas peticiones. Personalmente es la forma que tengo de seguir mejorando y practicando como administrador de sistemas y poder probar nuevos softwares y Sistemas Operativos sin necesidad de exponer mis datos ni la integridad de mis equipos físicos. With VirtualBox I have any operating system you need at any time, without having to format and install systems again. It is compatible with almost all operating systems, and allows you to define what type of virtual machine you need, at the level of resources or features. The only negative part is that if you run out of space on a disk it is not easy to resize it, it requires many commands and often the disk becomes unusable. With VirtualBox and an ISO image in a moment you can have a virtualized machine from any host. The integration with the host is great, including the mouse, the movement of files and even the network. I usually use VirtualBox to test the systems before putting them into production, saving me the typical initial bugs that the new releases have. Its my go-to software when ever I need virtualized OS, its easy to manage and configure. I usually import new vms from OVA of previously created vms and its quick as snapping finger. Another thing of Virtualbox advantage is its free and continuously evolving with new plugins and support. It also support for other Virtualization technology like Vagrant is a plus plus for me. At times USB mounting become headache. other than that I don't think of any other issue. Its a best Virtualization software available, give it a try at least. Needed vm for testing, deploying builds. Mostly builds required certain pair of application which required Linux OS, So a vm is the only option and Virtual box was our 1st choice. "Excellent software to create virtual machines for free"
I like that it is simple and intuitive when creating the virtual machines, it is quite complete and it works really well, you can use several operating systems at the same time without the need to restart the machine, its fast installation does not weigh much, it has a documentation pretty complete. That does not have the predefined ISO when creating virtual machines, since not everyone has them, it would be very useful to have a repository from which they could be accessed from the software and use them. You can test the operating systems that you want (Linux, Windows, Mac OS) and their versions without the need to format your machine, it is ideal for testing without harming your equipment, at the enterprise level we can save many costs since we can have virtualized servers without having large amount of irons, it is ideal for beginners and experts for its simple interface. "All you need for virtualize your Operating System!" I think that Virtual Box t is the best tool for virtualizing operating systems! In fact, according to me, it is fast, easy to setup and with many customizations options! It's completely free, it is immediate to use simply select the iso of the Operating System you want to virtualize, and VirtualBox will do all the rest! I would prefere a better User Interfarce, the present one is a little Spartan and often not easy to understand (it could be better organized and better managed). I hate the fact you need to download extra software (Guest-addition) for manage essential features like the full-screen option. On particular linux distro, Guest Additions don't work at all, and you need to bang your head a lot (with tutorial, forum, etc) to try make them work! A tool that has now become essential for everyone, both professionals, students, and simple IT enthusiasts. The tool is free, always updated, and generally simple to use. Virtual Box allowed us to virtualize all Operating System that we want, freeing ourselves from the weight of install them on our pc. Time is money and virtualbox has allowed us to save a lot of money. In case of problems, viruses, etc, with a couple of clicks you can go back to the previous situation without having to worry about formatting, cleaning etc. Virtual Box it's a really fast hypervisor to virtualize any operative system. Principally I use to virtualize a Windows 7 inside my desktop and laptop where I have running Ubuntu. The virtualized operative system is totally merged with the native computer, and you can move the files from on to the other really fast. The same with the network, you can make a NAT from the native to virtualized. "A simple but powerful virtualization software"
I really enjoy this software. It's free, can do almost all the things that the commercial virtualization apps do, and can virtualize practically all operating systems currently on the market. I love some features like drag and drop file between host and guest systems, the shared clipboard functionality. The start and stop of guest system is really fast too. The gui could be improved, in general it is a bit slower than commercial alternative especially when you need to install a new guest system or need to change features like space allocated or create new partition. To take full advantage of the virtual machine features (such as full screen view) you must install the Virtual Box guest addition's: for windows it's easy, on linux the installation is difficult and often with many problems especially for beginners. VirtualBox do the Job. With free license, and great flexbility for us it's the best way to create Virtual Machine. You will not feel the need for a commercial product by using Oracle VirtualBox! We have lowered costs (thanks to the complete free license) and increased flexibility thanks to virtualization. In addition we have the possibility to test the product on various real Operating System before releasing it, facilitating testing and bug fixes. I love VirtualBox. Especially the fact that it's free. I use it with free Windows developer profiles to test programs and websites in a Windows environment, which is handy for me since I'm on a Mac. It even gets leveraged by other programs I have to create virtual WordPress environments for local development. It has saved me a lot of money from having to buy other development platforms. I'm also able to share documents back and forth very easily between the virtual environment and my computer. Sometimes it can get a bit laggy, but I find that happens rarely, and if it does, I just close down some other programs that are running on my computer and it picks right back up. I recommend VirtualBox as an easy to use program for setting up other test environments on your local machine. I use VirtualBox for both local development of WordPress environments along with testing environments for other platforms. Ease of use: VBox is one of the easiest, most convenient ways of converting your single-OS machine into a multi-platform workstation - may it be a Kubernetes cluster, an Oracle DB on CentOS, Office on Windows, the latest Kali Linux, or anything else you can dream of! AFAIK it doesn't support nested 64-bit virtualization; other than that there are no shortcomings that I know of! "VirtualBox, Any OS you need"
The installation of VirtualBox in Linux that is my main work environment is very simple under archlinux since I only have to execute a simple command to install the application, it does not consume too many resources unless you assign excess RAM to the virtual machines. It is very easy to use virtual machines with internet access since VirtualBox configures us almost everything to work as if it were newly installed in a physical computer. The only thing that we must manually install in certain occasions are the additional drivers for the implementation of application that use 3D video. Finally the best of the application is everything it offers without asking anything in return, since the application is free. The only thing I do not like about the application is that by default it has activated the notifications that appear every time you start a virtual machine and that these notifications are really very annoying. Although it is possible to deactivate them manually I think that this option should be disabled by default. If you are looking for an application to virtualize operating systems that is free and multi platform, VirtualBox is your option because besides being one of the most popular applications of this type it has a lot of development time so it is very stable nowadays. I'm using VirtualBox to test applications in different operating systems since the projects we develop are usually multi-platform applications, so we need to test the applications in all the environments that the client needs. "From Small Projects to Large Deployments"
VirutalBox is in my development environment almost daily for when I need to set up virtual computers. I'll have one running Linux, one on Windows, one as a desktop or server or anything else I need. I can separate them into virtual environments, take snapshots of their current configuration to test things out. It is excellent for testing out development environments or training. It's probably my own setup, but it can be slow if you're trying to run several virtual machines, so best to have a dedicated desktop just for VMs. Read the manuals and people's instructions. Little things can trip you up like CPU settings. The biggest thing I use VirtualBox for is for development and training. If I have a client with a system I'm not familiar with, I can set up what they run, test it out, play with it, and know it well enough to serve my clients. If I'm trying to figure out a difficult problem or troubleshoot a client's issues, I can set up exactly what they run, take a snapshot, and then start troubleshooting bit by bit until I find the solution.
" a very good software to optimize our hardware resources"
"Un service une utilisation en des aide Faciles"
: comme je me suis amusé a vous le décrire VirtualBox est fait pour vous !! Lo que mas me agrada de virtual box es su interfaz gráfica, tiene opciones muy sencillas y la verdad es que es muy ligero. Crear un ambiente de sistema operativo con virtual box es muy sencillo, puedes crear maquinas virtuales con arquitecturas de 32 y 64 bits y asignarle los recursos de memoria y disco duro que deseas que consuma dicho ambiente. Puedes configurar los adaptadores de red si deseas que tu ambiente virtual tenga acceso o no a una conexión a internet. Debes tener un equipo con los recursos suficientes para que soporte los ambientes virtuales que deseas crear, ya que de lo contrario te sera muy tedioso trabajar con virtual box. Con virtual box puedes realizar mesas de laboratorios para utilizar distintos sistemas operativos sin necesidad de contar con otro equipo físico, ya sea para aprender a utilizarlos los otros ambientes de sistemas operativos que existen, ver sus novedades, estudiarlos, o ya sea para tener un servidor virtual. Hace unos meses necesitábamos modificar una imagen ISO que contenía el sistema operativo de windows 10, con la ayuda de Ntlite logramos modificar esta imagen ISO para que se instalara de forma desatendida y así instalarla en todos los equipos de allí en adelante. Todos los equipos que salieran del departamento de soporte técnico desde ese momento tenían que salir con la instalación de ese sistema operativo para que tuvieran las mismas configuraciones y parámetros deseados por el cliente. Con la ayuda de virtual box se lograron hacer todas las pruebas necesarias para que esa imagen ISO personalizada tuviera su acabado final. Me gusta lo estable que es esta herramienta, posee una gran comunidad que te pueden ayudar a resolver cualquier inconveniente que se te presente. Tiene una interfaz muy sencilla de utilizar. Al momento de crear una maquina virtual puedo elegir entre los diferentes ambientes de sistemas operativos que existen, incluso puedo elegir el tipo de arquitectura, asignarle la memoria ram adecuada dentro de que lo tenga disponible el equipo donde tenga instalado virtualbox y ademas de eso puedo elegir la capacidad de disco duro virtual que quiero que tenga el ambiente que voy a crear. Debes poseer una maquina con los recursos suficientes para que la virtualización corra fluida, deberian dar un cambio a su apariencia. No toma los controladores de pantalla automaticamente, se deben instalar manualmente para poder ajustar el tamaño de la pantalla de mi maquina virtual a una resolución adecuada. VirtualBox es un software de virtualización con el cual podras instalar cualquier ambiente de sistema operativo, es una herramienta completamente gratuita con la cual podras aprender a utilizar muchisimos sistemas operativos sin la necesidad de utilizar otro equipo. No e resuelto ningun tema laboral con el uso de esta herramienta, pero me ha servido para capacitarme con windows server 2012 y ubuntu ya que pude virtualizar ambos sistemas operativos y tomar cursos en linea para realizar pruebas y ensayos con ambos sistemas operativos. "An excellent software to test programs and functions in servers"
I totally recommend this software, it has helped me a lot, it is very useful to do a lot of testing, and in case of being damaged, the virtual machine does not affect the real machine, you just have to delete that machine and install a new. It helped me to do many software tests, before I had to try live on the server, this was complicated because sometimes I had failures and the server was given and it had to be restored. But with this tool now only programs that have already been tested in virtual machines are installed. 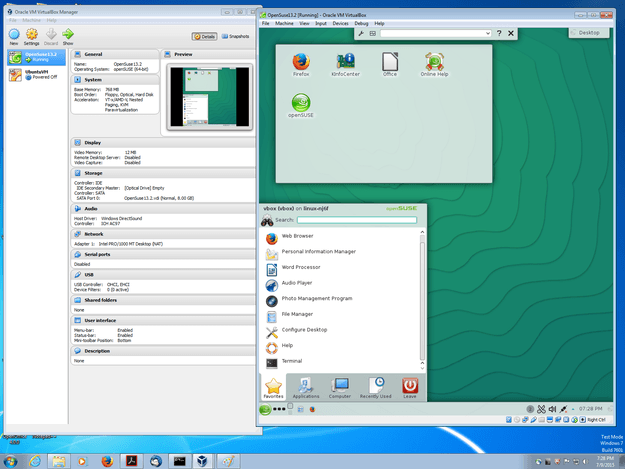 Virtual Box allows you to run several operating systems with only one computer. I am using it to run an Ubuntu virtual operating system on my Windows 10 laptop. It is very convenient to avoid having to buy a separate laptop, especially since I only use Ubuntu for a few specific tasks. The set up is not necessarily super easy to perform. I had to go through several tutorials in order to set it up properly. The software also crashed the first time I used it but hasn't since then. It can take some time to understand how to set it up, but just find a clear tutorial online and it should go smoothly. Virtual Box allows me to use Ubuntu on my work Windows 10 laptop without having to buy a separate computer, so it is very convenient and saved me a lot of money. "pruebas de sotfware en sistemas virtualizados con virtualbox"
Es una herramienta que saca de problemas a muchas personas de IT, ayuda a virtualizar sistemas operativos de cualquier fabricante optimizando recursos y dando una buena experiencia de uso, lo que mas me gusta e que puede configurar las maquinas de cualquier manera, me gusta tambien lo rapido que se generan las maquinas virtuales, y tambien la fluidez con la que va, claro esta que se deben tener un buen equipo anfitrion para poder tener buenas maquians virtuales que no afecten el rendimiento. no tengo disgusto con esta herramienta, es totalmente gratis, y ofrece buenos servicios, hasta los momentos he trabajado y he provado variedades de sotfware en ella con el interes de llevarlo a produccion luego de pruebas. y no me ha fallado en ningun momento. recomiendo totalmente para crear ambientes virtualizados tanto de produccion como de pruebas, ya que es una herramienta poderosa y estable, soporta muchos sistemas operativos, nos es para nada dificil de usar, aunque si debe tener el conocimiento para poder configurarla pero con buena documentacion resultaria facil hacerlo. Utilizo esta herramienta plenamente para probar sotfware, tambien la utilizo mucho para realizar laboratorios de pruebas, para examenes, talleres y practicas, las cuales requiero hacer para poder avanzar en mis estudios, laboralmente se llevan a prueba software en maquians virtuales se prueban y se llevan a produccion, la funcion principal que le damos a esta herramienta es la prueba de sotfware. "My virtual box experience for my studies"
It's provides a test environment to run virtual machines inside it.I have inserted two virtual machines windows 10 and Kali linux and exploited windows which makes me to find to critical vulnerabilities of windows 10.So the virtual box is really helpful and the functioning was really efficient.The application interface is very user friendly where each action could properly identified. It has been raised some compatibility issues while configuring virtual machines with new Operating systems.And also transferring files between client and host is bit difficult in this application. This is a good product where you can this product to set up your testing environments and to have more compatible working capacities with easy operation and manipulation. Setting up was easy and user friendly when using it. "Permet de émuler des machine comme windows ou linux sans probléme"